RAF St Mawgan – 2 miles from Newquay is the only RAF Station west of Oxfordshire and, as such, it is the hub of RAF activity in the Southwest. Opened as a Civilian Airfield in 1933, it was Requisitioned at the outbreak of WW2 and named RAF Trebelzue. The Airfield was rebuilt with 2 runways in 1940/41 and reopened in September 1941. On successful completion of the Civilian Course, Pupils would then be posted to the RAF Depot, Uxbridge, where they received their Uniforms and underwent Disciplinary & Administrative Training before being posted to an RAF Flying Training School (FTS) to continue with their Flying Training programme. They were issued with War Service (“Battledress”) uniform, which consisted of Tunic & Trousers. This could be worn in place of the “Best Blues” Jacket & Trousers whilst “working on Station” (“Best Blues” had to be worn on Parade, at Formal occasions and whenever the Trainee was “off Station”). On 16 June 1941 ‘B’ Flight, part of No.1 Elementary Flying Training School (1 EFTS); based at Hatfield, was transferred to a relief landing ground under the Command of Flight Lieutenant H J Greenland with 8 Tiger Moth Aircraft. During 1940 – DH.98 Mosquito, designed by de Havilland’s R E Bishop, which started as a private venture as initially there was no official backing for an unarmed, wooden Bomber, made its Maiden Flight. It was an immediate success and went on to become one of the outstanding Aircraft of WW2, ranked alongside the Spitfire, Hurricane & Lancaster. Panshanger began life as a Decoy Factory during WW2, prior to which the Airfield had been in use as Agricultural fields owned by the nearby Panshanger Estate. First established at Hatfield were the De Havilland School of Flying and the London Aeroplane Club. The land currently occupied by the Aerodrome is a much-reduced portion of the original 248 acres of Agricultural land farmed as part of the Panshanger Estate (Baron Grenfell & Lady Desborough). In June 1940 the Air Ministry, under the terms of the Emergency Powers Act (1939), acquired some 248 acres of Agricultural land at Holwell Hyde from the Panshanger Estate. The Site was then Leased to de Havilland, who were given the responsibility of constructing a Decoy Aircraft Factory to divert Enemy Bombers from their facility in Hatfield. By the late summer of 1940, it is likely that de Havilland were using the fields around the Decoy Factory as an all grass Reserve Landing Ground for Flying Training. This use is confirmed in an entry in the Operational Record Book (ORB) for the 4th January 1941 in which it states that a snow-clearing plan for the Reserve Landing Ground at Holwell Hyde had been issued. The School changed its name to No.1 Elementary & Reserve Flying Training School (E&RFTS) to reflect this. The Link Trainer was a synthetic training device (nowadays known as a flight simulator) which enabled Trainee Pilots to learn and practice flying. It consisted of a fuselage, containing a single-seater cockpit with instrument panel, stick and foot pedals; it enabled a Trainee to learn the basics and experience the sensation of flying, including banking, pitching and turning. The trainers were housed in purpose-built “Link Trainer” buildings at certain RAF Stations. Link Aviation Devices, Inc, Edwin Link, a Pilot himself, thought he had the answer. In 1928, Link left his father’s Organ Building Business to begin work on a “pilot trainer.” Link envisioned a device that would allow Pilots to take their early Flight Training while safely on the ground. With his organ building experience, he used air pump valves and bellows to make his trainer move in response to its controls. Edwin Link had developed a passion for flying in his boyhood years but was not able to afford the high cost of flying. So, upon leaving school in 1927, he started developing a simulator, an exercise which took him 18 months. His 1st Pilot Trainer, which debuted in 1929, resembled a toy Aeroplane from the outside, with short wooden wings and fuselage mounted on a universal joint. Organ bellows from the Link Organ Factory, the business his family owned and operated in Binghamton, New York, driven by an electric pump, made the trainer pitch and roll as the pilot worked the controls. The Fuselage was connected to an Instructor’s Desk, which contained a Synchronised Instrument Panel and a 3-wheeled Course Plotter (“crab”) which could plot the course being flown onto a map or sheet of paper. The Instructor was able to provide instructions to the Trainee and then record his progress, which could be reviewed at the end of each Exercise. 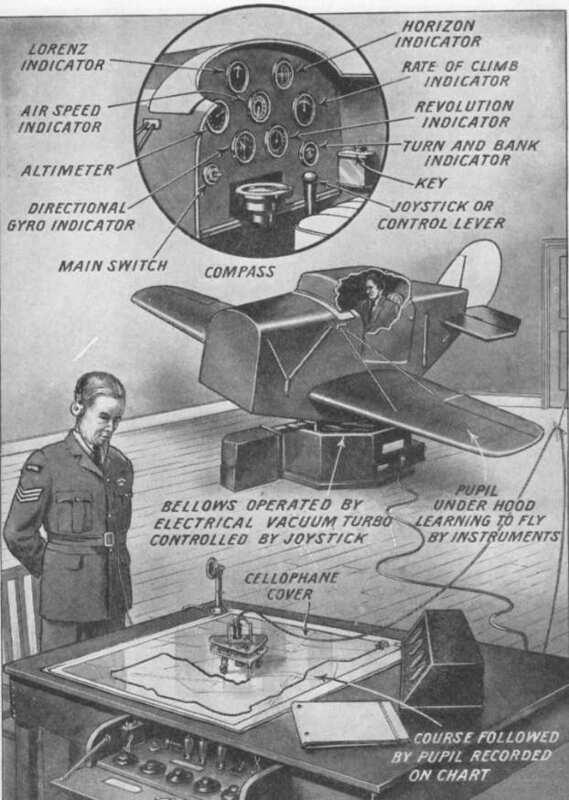 Air Publication AP1920 “The Link Trainer Instructors Handbook” contained a series of standard exercises which could be utilised across the various RAF Training Facilities. The 2nd major component is an external instructor’s station, which consists of a large map table, a repeated display of the main flight instruments, and a moving marker known as a “crab.” The crab moves across the glass surface of the map table, plotting the Pilot’s track. The Pilot & Instructor can communicate with each other via Headphones & Microphones. The Station was built as a Training Airfield, opening in 1940. No.17 Elementary Flying Training School (EFTS). Formed at North Luffenham in May 1941. Moved to Peterborough in July 1941. Unit disbanded in May 1942. It was later taken over by 5 Group of RAF Bomber Command as a Heavy Bomber Base, and was expanded by the building of concrete runways later in the War. Based at RAF Kidlington equipped with the North American Aviation Harvard’s AT 4. Barford St John. Built in 1941 and still in use. 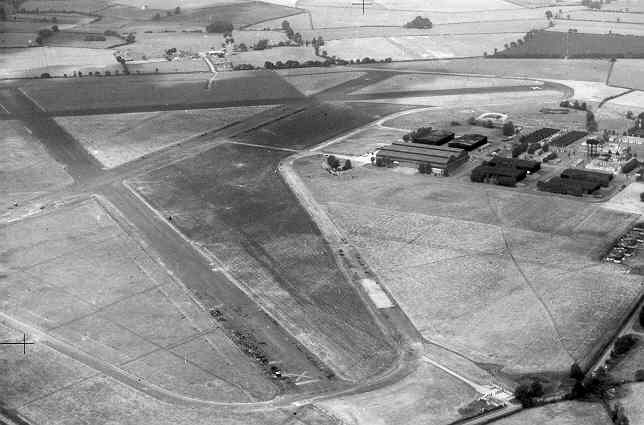 An RAF Station which was, initially, a Relief Landing Ground for No.15 Flying Service Training School, Kidlington. Kidlington was a Civil Airfield that was requisitioned in September 1939. In the rapidly changing world at that time it became a Maintenance Facility, a Satellite Airfield for Abingdon and an RAF Code Training Centre and the Base for No.6 Service Flying Training School, then No.15 Service Flying Training School. All within a year. In 1942 it became the 101 (Glider) OTU and later 102 (Glider) OTU was added. All Training activity ceased in June 1945 and gradually the Airfield ceased Military Operations. The Airfield was bombed on 3 November 1940, when 1 Airman was killed. Further attacks were on 27 February 1941 & 12 August 1941 but without any fatalities. One of the unsolved mysteries of the War is that Amy Johnson died en route to here but got lost in dense fog and parachuted to her death into the Thames Estuary. With effect from 30 July 1941 Leading Aircraftsman Alan John Laird Craig, 1194243, was granted a Commission as a Pilot Officer on Probation, 103561, in the General Duties Branch of the RAFVR. No.2 Central Flying School – Flying Airspeed Oxfords and Avro Tutors, A-Flight, Navigation, Night Flying and Landings – Flight Commander R M Hackney. An RAF Station located 1.5 mi (2.4 km) south of Church Lawford, Warwickshire, England, 3.0 miles (4.8 km) South-West of Rugby, Warwickshire. The Airfield opened in April 1941 and was used by the RAF for Pilot Training until it closed in 1955. The 1st Unit to use the Airfield was No. 2 Central Flying School flying Airspeed Oxfords and Avro Tutors from 15 June 1941 until 13 January 1942 when it was renamed No. 1 Flying Instructors School (FIS) flying Oxfords & Tutors carried on until October 1942. The Unit was again renamed to No. 18 (Pilots) Advanced Flying Unit RAF ((P)AFU) flying Oxfords and Boulton Paul Defiants on 27 October 1942 and operated until April 1945. Like neighbouring Bramcote, it was planned as a Bomber Station, provided with 3 concrete Runways covered with Tarmac. Church Lawford was provided with ample Hangarage, 1 Large Aircraft Shed, 6 Bellmans and later 10 Blisters. The Airfield opened in Spring 1941, and just 18 days later, on 30th May, became home to the No 2 Central Flying School, Training Instructors.